I am forever wishing there were more ethnic restaurants in Sonoma County to explore. To be fair, things have come a long way in the last few years; after all, Santa Rosa now boasts more than a few Vietnamese restaurants and there’s even an Ethiopian restaurant (and a good one at that). One of my newer favorites is Khoom Lanna, a Thai restaurant located in Santa Rosa’s Railroad Square. I visited on a Saturday night, and was struck by the simple, elegant interior. This theme carries over into Khoom Lanna’s food, as each dish is beautifully prepared but isn’t overdone or stuffy. My dining companion and I shared two entrees. The first was eggplant with beef. 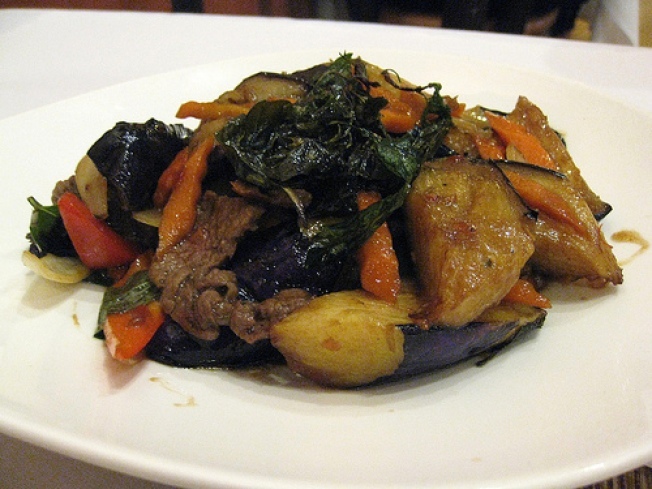 Stir-fried with ample basil and chili, the eggplant was soft and buttery and the beef was well-seared. Eggplant is one of my favorite vegetables, so I really enjoyed this dish and found myself wishing the serving size was a little larger. The next entree we shared was the drunken noodles. I can’t seem to visit an Asian restaurant without ordering at least one noodle dish, and I’m glad I chose this one at Khoom Lanna. The wide rice noodles were stir-fried and had that great chewy, slightly charred flavor that I love. Strips of beef, basil, chili, garlic, and vegetables rounded out this dish. Unable to resist the siren call of fried bananas and coconut ice cream, I also split a dessert. This was a decadent dessert to say the least and definitely meant to share. I don’t have much a of a sweet tooth, but I’m a sucker for Southeast Asian ones. Warm, crispy bananas with molten interior against cold, tropical ice cream? Yes, please. The service at Khoom Lanna is great too: attentive without being pushy. I left feeling excited not only for my next visit, but finally, for the state of ethnic food in Sonoma County. We’re headed in the right direction.